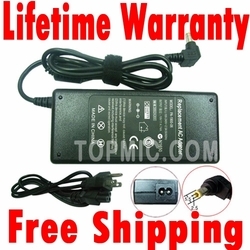 A new replacement charger for Asus A46CM, A56CM laptop models, with power cord included in the package. This Asus A Series charger (19v, 4.74a, 90W) is compatible with any Asus charger requiring 90W or less, as long as the voltage matches. The charger can be used globally, so take it with you when you travel internationally.